If you have heard of Midnight Syndicate then you know what Nox Arcana is all about- “imaginary soundtracks” of a gothic horror nature (for the most part). Music production seems to be entirely based on keyboard midi and other sampled instruments, which is in my opinion the one shortcoming of their music (I think the music would be significantly better if it were performed by real instruments, because, let’s face it, while production quality has gotten much better, you can often tell the difference and it makes the music sound a little cheap or cheesy.) 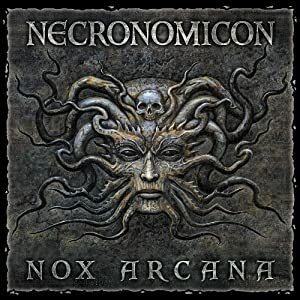 Nox Arcana started around the time that Midnight Syndicates production improved a bit, meaning that while this is their earlier albums it doesn’t suffer from the problems of Midnight Syndicate’s earliest albums. A half-way decent album which revolves around the themes of the horror’s described by H.P. Lovecraft. I personally enjoy playing Call of Cthulhu games and games that incorporate elements of the Cthulhu mythos. However, the type of mood I try to develop relies more on music that doesn’t sound like a few guys in the studio with a keyboard trying to be scary. The few tracks with spoken words in them remind me more of Goth kids trying to sound spooky rather than ancient cultists. I hope I’m not offending anyone with this review, but I hold my music, especially horror, to a pretty high standard. Overall I’d say it could be used for filler in a horror game, but I wouldn’t base important scenes around it.